Originally published in 1724--and now with an introduction and commentary by David Cordingly, best-selling author of the pirate classic Under the Black Flag--this famous account of the most notorious pirates of the day was an immediate success. 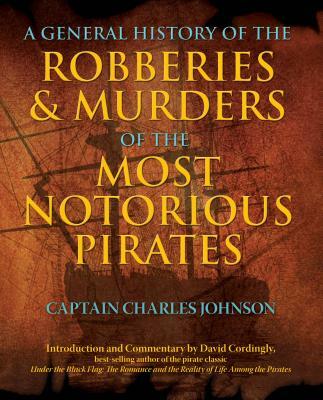 Written by the mysterious Captain Johnson, it appeared in the book world at a time since described as the "Golden Age of Piracy" and vividly captures the realities of the savage seafaring existence--detailing specific events, including trials, of the day's most feared pirates. Indeed, this book has become the main source for scholars seeking to learn more about the female pirates Mary Read and Anne Bonny, and was largely responsible for the posthumous fame of Blackbeard and Captain Kidd. In the 270 years since its first publication, it has come to be generally regarded as the classic study of one of the most popular subjects in maritime history. Captain Johnson was for some years thought to be Robinson Crusoe author Daniel Defoe. His exact identity is still unkown. David Cordingly is the author of the bestselling Under the Black Flag, Life Among the Pirates, Seafaring Women, The Billy Ruffian, and Cochrane: The Real Master and Commander. He was Keeper of Pictures and Head of Exhibitions at the National Maritime Museum for twelve years, where he organized such exhibitions as "Captain James Cook, Navigator," "The Mutiny on the Bounty," and "Pirates: Fact and Fiction." He lives by the sea in Brighton, England.